It had been raining the last few days, all traces of cherry blossoms are gone, aside from some petals scattered on the ground. Ever since I came back to Tokyo, I had been working around the clock to finalize the editing of my new film, LAST FRAGMENTS OF WINTER. Professor Ando (executive producer!) had hired the services of professional (and legendary) sound mixers and sound effects companies for the post-production, I'm very blessed. 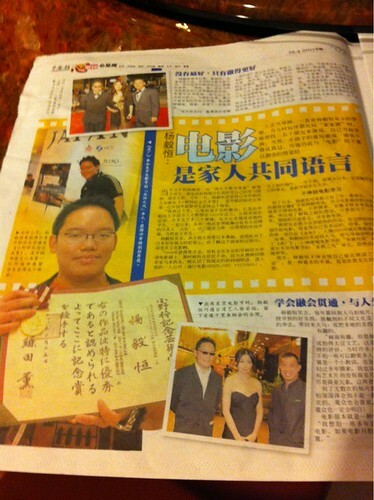 Two nights ago, I was made aware by a former schoolmate of mine that the Malaysian Chinese paper China Press' interview with me (and my mom), which I did just a day before I left Malaysia, was available online (Chinese only). It was a nice article that mentioned briefly about me picking up the Azusa Ono Memorial Award from Waseda University (being the first foreigner and all), my foray to Japan since 2008, the influences my parents had on me regarding my passion for films etc. 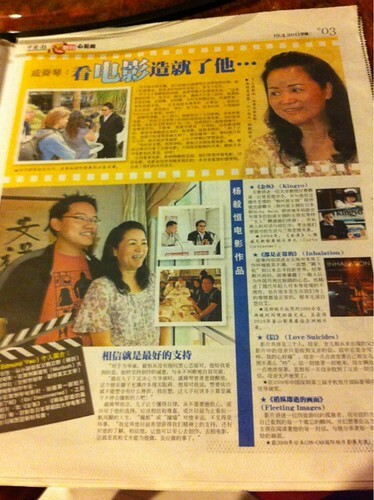 Of course, most interestingly, my mother was interviewed too. I'm flattered by the recent media coverage, it's good to shed some light upon Waseda University, Professor Ando, and the films that my cast and crew had poured their heart and soul into. I'm here today because of them anyway. I would like to point out though that not everything is that glamourous, and it's really not about the glamour. Look at it this way, while a nice newspaper article about me had just came out in Malaysia, I am here in Tokyo, thousands of kilometers away, undergoing a solitary confinement of sorts in the editing room, with minimal face-to-face human interaction, with my eyes fixed upon the computer the whole time as I adjust my shots, doing colour correction, waiting for the rendering, the exporting etc. Editing, as much as I love it, can sometimes be a rather arduous task. And lonely too, when you don't have anyone anymore (like, say, a producer) to come and check your progress. Nope, I can assure you, my dear readers, being a filmmaker is really not just about sitting there and yelling "action!" and "cut!". Now I switch to Chinese.